The I20059L provides real-time power metrics to help prevent overloads and safely optimize load levels. The unit offers local and IP-based monitoring with quick access to real-time power metrics and environmental sensor data. Using Visible Light Communication (VLC) technology, I20059L optically transmits power usage data from its LED display to a handheld device over the Geist Mobile App, presenting comprehensive real-time power usage data down to the phase and circuit levels. 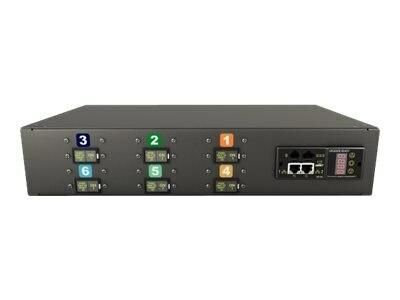 With the Geist Upgradeable hot-swap technology, users may easily upgrade PDUs to the latest available technology by replacing the Interchangeable Monitoring Device (IMD) module; all without causing any interruption.